The 2016 Nuclear Security Summit is taking place this week in Washington, D.C. More than 200 heads of state and security officials from about 56 countries are participating. I fear the closing date — April Fool’s Day — is ominous. Past summits (2010, 2012, 2014) have achieved tangible improvements in the security of nuclear materials and stronger international institutions that support nuclear security, but threats remain high and far too many nuclear weapons exist. Discussing ways to prevent an act of nuclear terrorism rather than what the world really needs –nuclear disarmament – seems the height (or depth) of foolishness. Strengthening the global system is important but surely not the solution to preventing nuclear and radiological terrorism and misuse — not to mention stopping the hemorrhage of funds spent on unnecessary weapons that cause health problems to all life throughout the process of making and storing them. This is a prime ecospirituality issue! There is no such thing as nuclear security when 15,000 nuclear weapons still exist in the world. In the United States, nuclear weapons spending is at an all-time high, and includes a 30-year program to “modernize” the U.S. nuclear arsenal and production facilities. 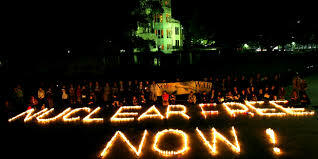 In his speech to the U.N. General Assembly, September 25, 2015, Pope Francis said: “There is urgent need to work for a world free of nuclear weapons, in full application of the non-proliferation treaty, in letter and spirit, with the goal of a complete prohibition of these weapons.” Amen to that! At the beginning of his administration, President Obama pledged “to seek the peace and security of a world without nuclear weapons.” Experts from the Arms Control Association say the summits have been “one of the administration’s most important achievement on foreign policy,” and I credit Obama that. 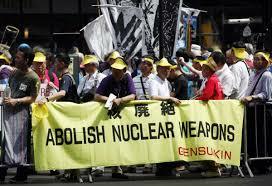 However, we are a long way from the security that can only come from abolishing nuclear weapons. Must we wait for an accident or worse? Citizen action is essential to pressure President Obama and other leaders to completely prohibit these weapons. Voting for candidates who espouse this goal and will work to fulfill it is something everyone can do. People in this photo are demonstrating, a personal call to which they responded. Others contact legislators. To what picture of action are you called? And deep gratitude to you, Megan, for your splendid commitment to following your call!